Such time dilation has been repeatedly demonstrated, for instance by small disparities in a pair of atomic clocks after one of them is sent on a space trip, or by clocks on the Space Shuttle running slightly slower than reference clocks on Earth, or clocks on GPS and Galileo satellites running slightly faster. Time dilation has also been the subject of science fiction works, as it technically provides the means for forward time travel. ". Emil Cohn (1904) specifically related this formula to the rate of clocks. In the context of special relativity it was shown by Albert Einstein (1905) that this effect concerns the nature of time itself, and he was also the first to point out its reciprocity or symmetry. Subsequently, Hermann Minkowski (1907) introduced the concept of proper time which further clarified the meaning of time dilation. Special relativity indicates that, for an observer in an inertial frame of reference, a clock that is moving relative to him will be measured to tick slower than a clock that is at rest in his frame of reference. This case is sometimes called special relativistic time dilation. 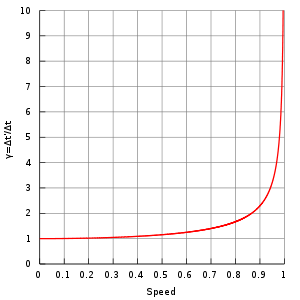 The faster the relative velocity, the greater the time dilation between one another, with the rate of time reaching zero as one approaches the speed of light (299,792,458 m/s). This causes massless particles that travel at the speed of light to be unaffected by the passage of time. Theoretically, time dilation would make it possible for passengers in a fast-moving vehicle to advance further into the future in a short period of their own time. For sufficiently high speeds, the effect is dramatic. For example, one year of travel might correspond to ten years on Earth. Indeed, a constant 1 g acceleration would permit humans to travel through the entire known Universe in one human lifetime..
With current technology severely limiting the velocity of space travel, however, the differences experienced in practice are minuscule: after 6 months on the International Space Station (ISS) (which orbits Earth at a speed of about 7,700 m/s) an astronaut would have aged about 0.005 seconds less than those on Earth. 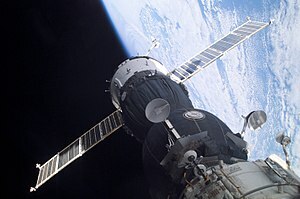 The cosmonauts Sergei Krikalev and Sergei Avdeyev both experienced time dilation of about 20 milliseconds compared to time that passed on Earth. Left: Observer at rest measures time 2L/c between co-local events of light signal generation at A and arrival at A. Time dilation can be inferred from the observed constancy of the speed of light in all reference frames dictated by the second postulate of special relativity. This constancy of the speed of light means that, counter to intuition, speeds of material objects and light are not additive. It is not possible to make the speed of light appear greater by moving towards or away from the light source. Consider then, a simple clock consisting of two mirrors A and B, between which a light pulse is bouncing. The separation of the mirrors is L and the clock ticks once each time the light pulse hits either of the mirrors. in the frame of the clock itself. Time UV of a clock in S is shorter compared to Ux′ in S′, and time UW of a clock in S′ is shorter compared to Ux in S.
Given a certain frame of reference, and the "stationary" observer described earlier, if a second observer accompanied the "moving" clock, each of the observers would perceive the other's clock as ticking at a slower rate than their own local clock, due to them both perceiving the other to be the one that's in motion relative to their own stationary frame of reference. Common sense would dictate that, if the passage of time has slowed for a moving object, said object would observe the external world's time to be correspondingly sped up. Counterintuitively, special relativity predicts the opposite. When two observers are in motion relative to each other, each will measure the other's clock slowing down, in concordance with them being moving relative to the observer's frame of reference. While this seems self-contradictory, a similar oddity occurs in everyday life. If two persons A and B observe each other from a distance, B will appear small to A, but at the same time A will appear small to B. Being familiar with the effects of perspective, there is no contradiction or paradox in this situation. The reciprocity of the phenomenon also leads to the so-called twin paradox where the aging of twins, one staying on Earth and the other embarking on a space travel, is compared, and where the reciprocity suggests that both persons should have the same age when they reunite. On the contrary, at the end of the round-trip, the traveling twin will be younger than his brother on Earth. 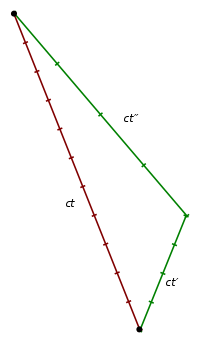 The dilemma posed by the paradox, however, can be explained by the fact that the traveling twin must markedly accelerate in at least three phases of the trip (beginning, direction change, and end), while the other will only experience negligible acceleration, due to rotation and revolution of Earth. During the acceleration phases of the space travel, time dilation is not symmetric. as deduced by Einstein (1905) from the Lorentz transformation, when the source is running slow by the Lorentz factor. as deduced by Einstein (1905). For ϕ = 90° (cos ϕ = 0) this reduces to fdetected = frestγ. This lower frequency from the moving source can be attributed to the time dilation effect and is often called the transverse Doppler effect and was predicted by relativity. In 2010 time dilation was observed at speeds of less than 10 meters per second using optical atomic clocks connected by 75 meters of optical fiber. A comparison of muon lifetimes at different speeds is possible. In the laboratory, slow muons are produced; and in the atmosphere, very fast moving muons are introduced by cosmic rays. Taking the muon lifetime at rest as the laboratory value of 2.197 μs, the lifetime of a cosmic ray produced muon traveling at 98% of the speed of light is about five times longer, in agreement with observations. An example is Rossi and Hall (1941), who compared the population of cosmic-ray-produced muons at the top of a mountain to that observed at sea level. The lifetime of particles produced in particle accelerators appears longer due to time dilation. In such experiments the "clock" is the time taken by processes leading to muon decay, and these processes take place in the moving muon at its own "clock rate", which is much slower than the laboratory clock. This is routinely taken into account in particle physics, and many dedicated measurements have been performed. For instance, in the muon storage ring at CERN the lifetime of muons circulating with γ = 29.327 was found to be dilated to 64.378 μs, confirming time dilation to an accuracy of 0.9 ± 0.4 parts per thousand. Clock C in relative motion between two synchronized clocks A and B. C meets A at d, and B at f.
Twin paradox. 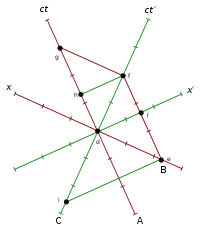 One twin has to change frames, leading to different proper times in the twin's world lines. In the Minkowski diagram from the second image on the right, clock C resting in inertial frame S′ meets clock A at d and clock B at f (both resting in S). 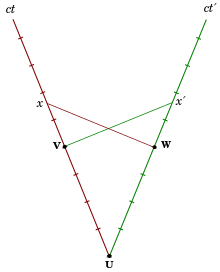 All three clocks simultaneously start to tick in S. The worldline of A is the ct-axis, the worldline of B intersecting f is parallel to the ct-axis, and the worldline of C is the ct′-axis. All events simultaneous with d in S are on the x-axis, in S′ on the x′-axis. The proper time between two events is indicated by a clock present at both events. It is invariant, i.e., in all inertial frames it is agreed that this time is indicated by that clock. Interval df is therefore the proper time of clock C, and is shorter with respect to the coordinate times ef=dg of clocks B and A in S. Conversely, also proper time ef of B is shorter with respect to time if in S′, because event e was measured in S′ already at time i due to relativity of simultaneity, long before C started to tick. From that it can be seen, that the proper time between two events indicated by an unaccelerated clock present at both events, compared with the synchronized coordinate time measured in all other inertial frames, is always the minimal time interval between those events. However, the interval between two events can also correspond to the proper time of accelerated clocks present at both events. Under all possible proper times between two events, the proper time of the unaccelerated clock is maximal, which is the solution to the twin paradox. Thus the duration of the clock cycle of a moving clock is found to be increased: it is measured to be "running slow". The range of such variances in ordinary life, where v ≪ c, even considering space travel, are not great enough to produce easily detectable time dilation effects and such vanishingly small effects can be safely ignored for most purposes. It is only when an object approaches speeds on the order of 30,000 km/s (1/10 the speed of light) that time dilation becomes important. In special relativity, time dilation is most simply described in circumstances where relative velocity is unchanging. Nevertheless, the Lorentz equations allow one to calculate proper time and movement in space for the simple case of a spaceship which is applied with a force per unit mass, relative to some reference object in uniform (i.e. constant velocity) motion, equal to g throughout the period of measurement. The clock hypothesis was implicitly (but not explicitly) included in Einstein's original 1905 formulation of special relativity. Since then, it has become a standard assumption and is usually included in the axioms of special relativity, especially in the light of experimental verification up to very high accelerations in particle accelerators. Gravitational time dilation is experienced by an observer that, being under the influence of a gravitational field, will measure his own clock to slow down, compared to another that is under a weaker gravitational field. Gravitational time dilation is at play e.g. for ISS astronauts. While the astronauts' relative velocity slows down their time, the reduced gravitational influence at their location speeds it up, although at a lesser degree. Also, a climber's time is theoretically passing slightly faster at the top of a mountain compared to people at sea level. It has also been calculated that due to time dilation, the core of the Earth is 2.5 years younger than the crust. "A clock used to time a full rotation of the earth will measure the day to be approximately an extra 10 ns/day longer for every km of altitude above the reference geoid." Travel to regions of space where extreme gravitational time dilation is taking place, such as near a black hole, could yield time-shifting results analogous to those of near-lightspeed space travel. Contrarily to velocity time dilation, in which both observers measure the other as aging slower (a reciprocal effect), gravitational time dilation is not reciprocal. This means that with gravitational time dilation both observers agree that the clock nearer the center of the gravitational field is slower in rate, and they agree on the ratio of the difference. 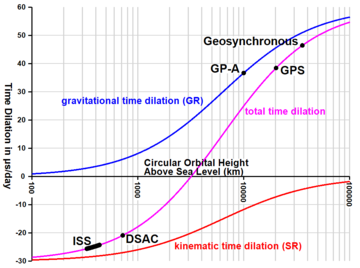 In 2010 gravitational time dilation was measured at the earth's surface with a height difference of only one meter, using optical atomic clocks. Daily time dilation (gain or loss if negative) in microseconds as a function of (circular) orbit radius r = rs/re, where rs is satellite orbit radius and re is the equatorial Earth radius, calculated using the Schwarzschild metric. At r ≈ 1.497 [Note 1] there is no time dilation. Here the effects of motion and reduced gravity cancel. ISS astronauts fly below, whereas GPS and Geostationary satellites fly above. Daily time dilation over circular orbit height split into its components. High accuracy timekeeping, low earth orbit satellite tracking, and pulsar timing are applications that require the consideration of the combined effects of mass and motion in producing time dilation. Practical examples include the International Atomic Time standard and its relationship with the Barycentric Coordinate Time standard used for interplanetary objects. from the clock. This sum includes any tidal potentials. is the Newtonian potential, equivalent to half of the escape velocity squared. ^ Average time dilation has a weak dependence on the orbital inclination angle (Ashby 2003, p.32). 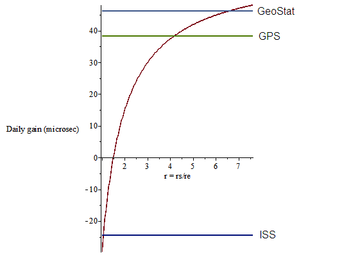 The r ≈ 1.497 result corresponds to  the orbital inclination of modern GPS satellites, which is 55 degrees. ^ a b c Ashby, Neil (2003). "Relativity in the Global Positioning System" (PDF). Living Reviews in Relativity. 6 (1): 16. Bibcode:2003LRR.....6....1A. doi:10.12942/lrr-2003-1. PMC 5253894. PMID 28163638. ^ a b c Toothman, Jessika (2010-09-28). "How Do Humans age in space?". HowStuffWorks. Retrieved 2018-04-08. ^ a b Lu, Ed. "Expedition 7: Relativity". Ed's Musing from Space. NASA. Retrieved 2018-04-08. ^ "Is time travel possible?". NASA Space Place. Retrieved 2018-08-03. ^ Miller, Arthur I. (1981). Albert Einstein's Special Theory of Relativity: Emergence (1905) and Early Interpretation (1905–1911). Reading, Massachusetts: Addison–Wesley. ISBN 978-0-201-04679-3. .
^ Darrigol, Olivier (2005). The Genesis of the Theory of Relativity (PDF). Séminaire Poincaré. 1. pp. 1–22. doi:10.1007/3-7643-7436-5_1. ISBN 978-3-7643-7435-8. ^ Larmor, Joseph (1897). "On a Dynamical Theory of the Electric and Luminiferous Medium, Part 3, Relations with Material Media" . Philosophical Transactions of the Royal Society. 190: 205–300. Bibcode:1897RSPTA.190..205L. doi:10.1098/rsta.1897.0020. ^ Einstein, Albert (1905). "Zur Elektrodynamik bewegter Körper". Annalen der Physik. 322 (10): 891–921. Bibcode:1905AnP...322..891E. doi:10.1002/andp.19053221004. . See also: English translation. ^ Calder, Nigel (2006). Magic Universe: A grand tour of modern science. Oxford University Press. p. 378. ISBN 978-0-19-280669-7. ^ Overbye, Dennis (2005-06-28). "A Trip Forward in Time. Your Travel Agent: Einstein". The New York Times. Retrieved 2015-12-08. ^ Gott, J., Richard (2002). Time Travel in Einstein's Universe. p. 75. ^ Cassidy, David C.; Holton, Gerald James; Rutherford, Floyd James (2002). Understanding Physics. Springer-Verlag. p. 422. ISBN 978-0-387-98756-9. ^ Cutner, Mark Leslie (2003). Astronomy, A Physical Perspective. Cambridge University Press. p. 128. ISBN 978-0-521-82196-4. ^ Lerner, Lawrence S. (1996). Physics for Scientists and Engineers, Volume 2. Jones and Bartlett. pp. 1051–1052. ISBN 978-0-7637-0460-5. ^ Ellis, George F. R.; Williams, Ruth M. (2000). Flat and Curved Space-times (2n ed.). Oxford University Press. pp. 28–29. ISBN 978-0-19-850657-7. ^ Adams, Steve (1997). Relativity: An introduction to space-time physics. CRC Press. p. 54. ISBN 978-0-7484-0621-0. ^ Blaszczak, Z. (2007). Laser 2006. Springer. p. 59. ISBN 978-3540711131. ^ Hasselkamp, D.; Mondry, E.; Scharmann, A. (1979). "Direct observation of the transversal Doppler-shift". Zeitschrift für Physik A. 289 (2): 151–155. Bibcode:1979ZPhyA.289..151H. doi:10.1007/BF01435932. ^ Einstein, A. (1905). "On the electrodynamics of moving bodies". Fourmilab. ^ a b Chou, C. W.; Hume, D. B.; Rosenband, T.; Wineland, D. J. (2010). "Optical Clocks and Relativity". Science. 329 (5999): 1630–1633. Bibcode:2010Sci...329.1630C. doi:10.1126/science.1192720. PMID 20929843. ^ Stewart, J. V. (2001). Intermediate electromagnetic theory. World Scientific. p. 705. ISBN 978-981-02-4470-5. ^ a b Edwin F. Taylor, John Archibald Wheeler (1992). Spacetime Physics: Introduction to Special Relativity. New York: W. H. Freeman. ISBN 978-0-7167-2327-1. ^ See equations 3, 4, 6 and 9 of Iorio, Lorenzo (2005). "An analytical treatment of the Clock Paradox in the framework of the Special and General Theories of Relativity". Foundations of Physics Letters. 18 (1): 1–19. arXiv:physics/0405038. Bibcode:2005FoPhL..18....1I. doi:10.1007/s10702-005-2466-8. ^ Rindler, W. (1977). Essential Relativity. Springer. pp. 49–50. ISBN 978-3540079705. ^ Bailey, H.; Borer, K.; Combley F.; Drumm H.; Krienen F.; Lange F.; Picasso E.; Ruden W. von; Farley F. J. M.; Field J. H.; Flegel W. & Hattersley P. M. (1977). "Measurements of relativistic time dilatation for positive and negative muons in a circular orbit". Nature. 268 (5618): 301–305. Bibcode:1977Natur.268..301B. doi:10.1038/268301a0. ^ Roos, C. E.; Marraffino, J.; Reucroft, S.; Waters, J.; Webster, M. S.; Williams, E. G. H. (1980). "σ+/- lifetimes and longitudinal acceleration". Nature. 286 (5770): 244–245. Bibcode:1980Natur.286..244R. doi:10.1038/286244a0. ^ "New calculations show Earth's core is much younger than thought". Phys.org. 26 May 2016. ^ Burns, M. Shane; Leveille, Michael D.; Dominguez, Armand R.; Gebhard, Brian B.; Huestis, Samuel E.; Steele, Jeffrey; Patterson, Brian; Sell, Jerry F.; Serna, Mario; Gearba, M. Alina; Olesen, Robert; O'Shea, Patrick; Schiller, Jonathan (18 September 2017). "Measurement of gravitational time dilation: An undergraduate research project". American Journal of Physics. 85 (10): 757–762. arXiv:1707.00171. doi:10.1119/1.5000802. ^ Ashby, Neil (2002). "Relativity in the Global Positioning System". Physics Today. 55 (5): 45. Bibcode:2002PhT....55e..41A. doi:10.1063/1.1485583. ^ See equations 2 & 3 (combined here and divided throughout by c2) at pp. 35–36 in Moyer, T. D. (1981). "Transformation from proper time on Earth to coordinate time in solar system barycentric space-time frame of reference". Celestial Mechanics. 23 (1): 33–56. Bibcode:1981CeMec..23...33M. doi:10.1007/BF01228543. hdl:2060/19770007221. ^ A version of the same relationship can also be seen at equation 2 in Ashbey, Neil (2002). "Relativity and the Global Positioning System" (PDF). Physics Today. 55 (5): 45. Bibcode:2002PhT....55e..41A. doi:10.1063/1.1485583. ^ Nave, C. R. (22 August 2005). "Hafele and Keating Experiment". HyperPhysics. Retrieved 2013-08-05. ^ "Einstein" (PDF). Metromnia. National Physical Laboratory. 2005. pp. 1–4. Callender, C.; Edney, R. (2001). Introducing Time. Icon Books. ISBN 978-1-84046-592-1. Einstein, A. (1905). "Zur Elektrodynamik bewegter Körper". Annalen der Physik. 322 (10): 891. Bibcode:1905AnP...322..891E. doi:10.1002/andp.19053221004. Einstein, A. (1907). "Über die Möglichkeit einer neuen Prüfung des Relativitätsprinzips". Annalen der Physik. 328 (6): 197–198. Bibcode:1907AnP...328..197E. doi:10.1002/andp.19073280613. Hasselkamp, D.; Mondry, E.; Scharmann, A. (1979). "Direct Observation of the Transversal Doppler-Shift". Zeitschrift für Physik A. 289 (2): 151–155. Bibcode:1979ZPhyA.289..151H. doi:10.1007/BF01435932. Ives, H. E.; Stilwell, G. R. (1938). "An experimental study of the rate of a moving clock". Journal of the Optical Society of America. 28 (7): 215–226. doi:10.1364/JOSA.28.000215. Ives, H. E.; Stilwell, G. R. (1941). "An experimental study of the rate of a moving clock. II". Journal of the Optical Society of America. 31 (5): 369–374. doi:10.1364/JOSA.31.000369. Joos, G. (1959). "Bewegte Bezugssysteme in der Akustik. Der Doppler-Effekt". Lehrbuch der Theoretischen Physik, Zweites Buch (11th ed.). Larmor, J. (1897). "On a dynamical theory of the electric and luminiferous medium". Philosophical Transactions of the Royal Society. 190: 205–300. Bibcode:1897RSPTA.190..205L. doi:10.1098/rsta.1897.0020. (third and last in a series of papers with the same name). Poincaré, H. (1900). "La théorie de Lorentz et le principe de Réaction". Archives Néerlandaises. 5: 253–78. Puri, A. (2015). "Einstein versus the simple pendulum formula: does gravity slow all clocks?". Physics Education. 50 (4): 431. Bibcode:2015PhyEd..50..431P. doi:10.1088/0031-9120/50/4/431. Reinhardt, S.; et al. (2007). "Test of relativistic time dilation with fast optical atomic clocks at different velocities" (PDF). Nature Physics. 3 (12): 861–864. Bibcode:2007NatPh...3..861R. doi:10.1038/nphys778. Archived from the original (PDF) on 2009-07-12. Rossi, B.; Hall, D. B. (1941). "Variation of the Rate of Decay of Mesotrons with Momentum". Physical Review. 59 (3): 223. Bibcode:1941PhRv...59..223R. doi:10.1103/PhysRev.59.223. Weiss, M. "Two way time transfer for satellites". National Institute of Standards and Technology. Archived from the original on 2017-05-29. Voigt, W. (1887). "Über das Doppler'sche princip". Nachrichten von der Königlicher Gesellschaft der Wissenschaften zu Göttingen. 2: 41–51. Merrifield, Michael. "Lorentz Factor (and time dilation)". Sixty Symbols. Brady Haran for the University of Nottingham.